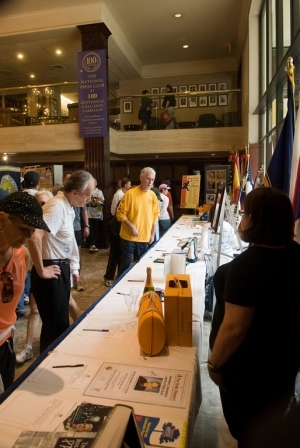 Members and runners peruse silent auction items, with proceeds going to the Eric Friedheim National Journalism Library. 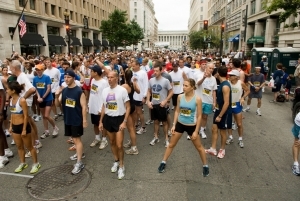 Runners begin warming up at the starting line minutes before the start of the National Press Club 5k. 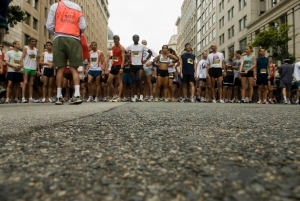 A view of the finish area after the 12th Annual National Press Club 5k. 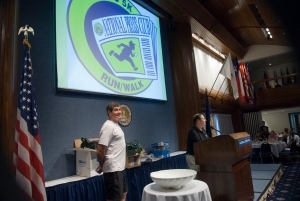 National Press Club 5k runners checking in and receiving their C-SPAN bags and t-shirts. 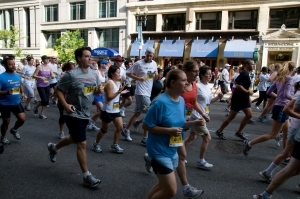 Runners participating in the National Press Club 5k Run that benefits the Eric Friedheim National Journalism Library Scholarship Fund. 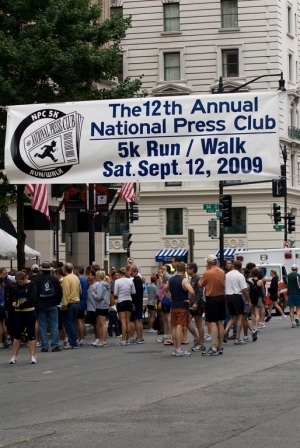 The National Press Club, the leading professional organization for journalists, wants to recruit promising future journalists who will bring diversity to American journalism. The scholarship consists of a $2,000 one-year scholarship, which can be renewed for up to three years at $2,500 per year. The first-year scholarship includes an additional $500 book stipend, the Ellen Masin Persina Scholarship. 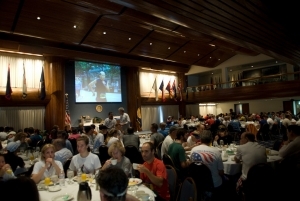 The National Press Club, a 100-year-old organization of reporters and newsmakers in Washington, D.C., is proud to offer a fellowship for graduate students in journalism. The fellowship is named for Dennis Feldman, a club member who had a long career as a journalist and public relations adviser after putting himself through grad school at night. Winners will receive a one-time stipend of $5,000 to help defray post-graduate tuition costs. The National Press Club is pleased to announce that the late Richard G. Zimmerman, a member of long standing, has endowed a significant scholarship in aid of high school seniors who wish to pursue a career in journalism. Recipients will receive a non-renewal award of $5,000.